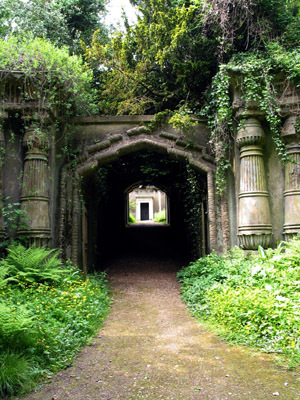 This entry was posted in Notorious Match, Regency, Uncategorized and tagged Highgate Cemetery, Lansdowne Passage, London ghosts, London highwaymen, Loquacious Lady, Prince Regent by Angelyn. Bookmark the permalink. Very interesting. I was in that area several times, but didn’t see this. Oh, dear, that means I need to return, doesn’t it? Great! I’ll go with you. Just let me know. I love a good ghost story, Angelyn! Great post! Thanks, Susan! The Loquacious Lady of Lansdowne Passage was a woman seen primarily by male pedestrians. She would join them, walking alongside in the dark passage in such a forward way she was presumed to be a prostitute. But then she would disappear at the steps leading out of the walkway. You are too funny, Ashley! Thanks for stopping by! Fun post. I feel sorry for the poor horse trying to negotiate stairs. So did I. In fact, I was reminded of the ha-ha post I did awhile back. To jump down into the dark passage must have been very worrisome for the equine. Thanks for commenting, Ally. I enjoyed this very much, Angelyn! I could just see the wild-eyed horse going up those stairs. I can imagine how shivery this passage must be. Thanks for sharing! I’m so glad you enjoyed it, Lauren. Even the most placid horse would be spooked by the narrow, dark alley where any moment a predator might spring down from above. Really, horses would have an entirely different perspective of why this passage was so scary. This was so interesting. It caused me to check Google maps to see what this area looks like today. With my imagination, I find London a very spooky place. I remember thinking I saw an effigy move. Now that was eerie. Oh, yes. Those wretched effigies. By all means check out Google maps and put the little pedestrian dude on that spot. You can really see how very mutilated the house is. This post really got my imagination spinning. I too love the layers that build up in old cities (that’s why I love Rome so much). The juxtaposition of old and modern in the last line was the perfect touch to finish with. There really can’t be any comparison to Rome. What are current generations leaving there and in other great metropolises that the future will ponder over? Not much, I daresay. I’ve seen your blog, Sam. The post on Southampton and Katherine Howard are quite good. You are welcome to pop in and link anytime. Oops–small correction. Should be the Marquess of Hartington. Not viscount. There are some photos of the old Passage extant; try denniswheatley.info under “Franklin Johnson’s event” in the What’s New section. There is a flurry of action in the Passage in one of Wheatley’s books “The Second Seal”, an excellent thriller about the outbreak of the Great War in 1914. I think when the front of Lansdowne House was demolished to create FitzMaurice Place (linking Curzon St. with Berkeley Square) the grounds were opened up and the new Row was built on the grounds, just north of the old Passage. The passage was filled in, and shops built on top, to make the south side of the Row. All that is left of the old Passage are the steps leading down from Berkeley St. to what is now a hotel basement entrance, and the Highwayman’s Gate, still there after two centuries but now rather pointless. Incidentally, the photos show there were no steps at the Curzon St. end, just a vertical bar to stop horses. I’ve just visited the site–and thrilled to see your photo of the passage as it now appears. And the gate is still there! Thank you so much for adding this information to a fascinating subject.